Product history: Mage Knight Rebellion debuted (in prototype form) at this year's Gen Con, where it caused quite a stir, but nothing like the tidal wave of interest created when the actual product shipped and immediately started flying off retailers' shelves in November. Developed by two savvy game industry pros, Jordan Weisman (FASA) and Kevin Barrett (ICE), Mage Knight combines the 3-dimensional fun of miniature-based wargaming (think Warhammer) with the collectibility-driving chase element seen in collectible card games such as Magic, the Gathering. Why it's hot: Mage Knight has several major advantages over previous miniature-based gaming systems. First, the miniatures are pre-painted and the game system is simple enough that it can be played right out of the box. The major innovation in Mage Knight is found in the base for each figure, which contains all the power ratings, magical abilities and other statistics for that figure along with a moveable dial and a display slot. This means that an eleven-page rulebook is all that is necessary to play this game. Equally important for retailers, many of whom have avoided stocking miniatures because of the vast number of skus and corresponding need for extensive shelf space, is the fact that the Mage Knight miniatures are boxed together (ten in the starter box, and five in the booster packs). The final element in the rising popularity of this game is provided by the insertion of one rare figure in each starter set and booster pack. The rare figures are currently doing very well in the aftermarket, with some selling for more than US$20 each on eBay. Contents: The Starters include ten randomly assorted figures, an eleven-page rule booklet, a special ability card, two dice, a tape measure, stickers, and a special comic explaining the world of Mage Knight. Each booster pack includes five randomly packed, pre-painted figures. Players can augment their forces by purchasing additional starters and booster packs. Additional figures will be available in first quarter of 2001 when four different 'Army Sets' will be issued. These sets, which are similar to the themed decks in the world of collectible card games, will include an eight-figure 200-point army, made up of common figures from the Mage Knight base set as well as one random rare figure. The 'Army Sets' will retail for US$12.95. 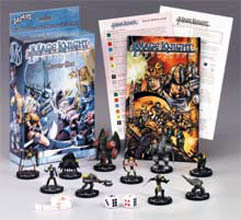 Target audience: Mage Knight's appeal goes far beyond the realm of hobby gamers thanks to the pre-painted miniatures which are ready to go right out of the box -- and the starter set with its ten fascinating figures makes a great holiday gift. With its random inclusion of rare figures, the easy-to-play rules, and the starter and booster pack format Mage Knight has demonstrated a strong appeal to Magic fans. While Mage Knight has not come close to generating the mass market appeal of Magic, this product has the potential to appeal to a much wider audience than any miniature-based gaming system. Distributed by all major game distributors; not available to retailers direct. Little or no mass market distribution at this time.